Monday-Thursday 6:30 a.m. to 7:00 p.m.
Friday 6:30 a.m. to 6:00 p.m.
*Massage Therapy and Personal Training also available on alternating Saturdays 8:00 A.M. to 12:00 P.M. 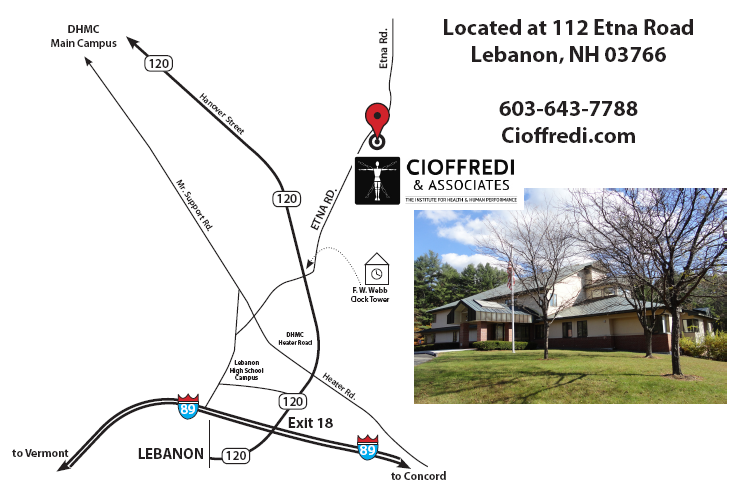 The Lebanon Clinic is at 112 Etna Road in Lebanon, NH. FROM I-89: take EXIT 18, follow Rt. 120 North for approximately .8 miles, take a right onto Etna Road (F.W. Webb Clock Tower is on corner). We are located at 112 Etna Road, approximately .6 miles down on the right. Other businesses at this address include Marker-Volkl and Fujifilm/Dimatix. PLEASE ENTER VIA FRONT ENTRY. We are one level up. There is a lift for those who are unable to use the stairs. We’re happy to offer assistance; please ring the doorbell if you’d like help. PARKING: We have 7 visitor spaces in addition to 3 handicap spaces at our front entrance, as well as six spaces in the lot at the right of the building (as you enter from Etna Road), but feel free to park anywhere in our lot if those spaces are full. Bring with You to Your First Appointment: Your insurance card & copay if applicable, referral from your doctor if you have one, and your calendar to schedule your follow up visits. Please wear loose fitting comfortable clothing, and bring indoor gym shoes to change into (especially in the winter months!). We look forward to seeing you soon!